This was a winner in 2004 Top 10 Competition. I had several bottles which I've been drinking over the past year and have been very pleased with it. I'm now down to my last two bottles after opening one last night. This wine is drinking really well now, it was a real delight. Beautiful rich colour and opulent up-front damson flavours. There are some complex undercurrents of tobacco and a slight pinot-noir like earthiness. This is a wine that develops, and I really should have opened it earlier -- or maybe decanted it. Something to remember for next time. Môreson -- the name means morning sun -- are in the Franschhoek Valley which is not an area famous for Pinotage, but Môreson have shown the variety can do well there. Môreson also use Pinotage in their white MCC sparkler, and such was the quality of the juice they bottled some as a dry still white wine. Unfortunately the Wine & Spirit Board wouldn’t approve this for sale, since they reckoned a white Pinotage didn't meet varietal characteristics. But I tasted some at the farm from an unlabelled bottle and it does make a crisp fruity wine. How time flies. 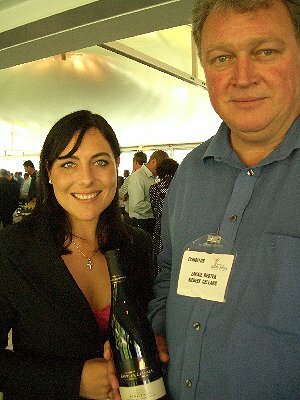 Last year I was one of the judges of the annual Pinotage Top 10 2005 competition. This years judges were Guido Francque (food and wine connoisseur from Belgium and honorary member of the Pinotage Association), Janåke Johansson (Swedish wine consultant and trader), Charles Hopkins (cellar master and vice-chairman of the Pinotage Association), Neil Pendock (wine writer), Sue van Wyk (Cape Wine Master from Australia) and Dave Hughes (international wine judge/writer from South Africa). The upward trend in the quality of Pinotage wines continues, and it is really exciting to see new names challenge the established wineries. This year, half of the Top 10 are first time winners (marked with an asterisk). The remaining five are repeat winners. Kanonkop Estates seventh win brings it level now with top winner L'Avenir Estate. I remember being impressed with Camberley's first ever vintage, 2001, which my friend Keith Prothero had found pressed on me. The runners up contains, despite my constant efforts, a wines I have not come across yet (Dornier) and name that I have never even heard of (Fantail). I'll haveto hunt them out next February in the Cape. Congratulations to all of them, and also the judges. It is difficult to decide a winner when there are so many good wines now being made. Diemersfontein Pinotage -- now it's the other way round!! Every one who tastes Diemersfontein's Pinotage remarks on its incredible dense coffee and chocolate flavours. Of course, there isn't really any coffee or chocolate in the wine but it sure tastes like it. Now Diemersfontein have taken the concept and turned it around. They have just launched dark Belgian Chocolates with a coffee and Pinotage truffle filling. They are delicious!! And even better with a glass of Pinotage! Zakkie Bester (pictured right with Mareli Viljoen) is winemaker at Riebeek Cellars, a co-operative that has the good luck to be situated in the Swartland -- an area proving to be one of the best for full flavoured red wines. I've met Zakkie several times over the years and he is always keen to show me his Pinotage -- and I'm always glad to taste it. The 2005 Reserve, that he is holding in the picture, is the current release and it is really very very nice. It is a rich ruby red colour, with upfront berry and plum fruits and some vanilla in the mid-palate. It's soft and mouth filling and there's enough acidity on the finish to match well with food. Zakkie tells me that half the wine was fermented in 2nd fill 300 litre French oak barrels, in which they also went malolactic fermentation and then aged for 6 months, then blended back with the half that was made in stainless steel in order to produce a subtly oaked wine. Riebeek are a winery that hasn't (yet) been claimed by fickle fashion and so their wines continue to be reasonably priced and are well worth a try when you see them. Zakkie also showed me his 2006 Pinotage Rose. This was had a bluish tinge to its pink colour (maybe the effect of flourescent lighting). It had a strawberry bubblegum nose and strawberries came through on the flavour; soft and off dry (5 grammes of sugar per litre). Not one for me, but certain to be popular with those wanting an easy-to-drink pink. Zakkie said he picked the fruit a lot earlier than the grapes used in the red wines, and this wine was made from only the free run juice. Intense dark garnet/purple colour. My first impression is of smokey bacon over ripe damsons and black cherries. There's a complexity of flavours, but over a core of tannins that are more prominent than I remember. I think this wine is going through a dumb stage where the prominence of the fruit has dipped from my earlier tastes. With a little more age I expect the tannins will soften and allow more of the fruit to shine through. All the same, it was a most enjoyable and drinkable wine that all to0 quickly emptied the bottle, leaving us wanting more. I highly rate Laibach as a winery, although unfortunately we don't often see their wines on sale in the UK as they mostly go to Germany. In particular -- as well as their Pinotage -- their Bordeaux blends Dogleg and the organic Ladybird are worth looking out for. Lusciousness and Decay - or a Pile of Old Pinotage? After fermenting red grapes the new wine is pressed from the grape skins which are usually recycled back to the vineyards as fertiliser. But at Windmuel they have been piled high for an art project. Artist Berni Searle has filmed herself "precariously on top of a huge mound of crushed red grape skins that have been spurted out from an overhead funnel. En masse the grape skins form a sensuous reddish purple backdrop, simultaneously evoking lusciousness and decay. Shot mainly in slow motion, at dusk and dawn, the work has a contemplative dreamlike quality which is disrupted by an unexpected series of 'falls'. While the work alludes to the traditional process of crushing grapes with one's feet, this ritual enactment becomes futile since the juice of the grapes has already been extracted, pointing to a more symbolic/evocative reading of ideas relating to abundance, excess and vulnerability. " This is me last week picking the very first Pinotage grapes harvested in Ontario, Canada. I was at Fieldmouse Vineyards , owned by Peter and Susan Laidlaw. Peter planted a row of Pinotage five years ago; these vines have now grown for four vintages and now they're ready for picking. The bunches were firm and full with even ripening and no unripe green grapes (see picture on right), no insect or bird damage and only some insignificant botrytis. Brix was 23 (giving a potential alcohol level of 12.5%) while Peter's Pinot Noir was 18-20 and Peter reckoned his Pinot Noir would need another week before they were ready to be picked. Peter said "Based on the grape quality and early ripening I'm pretty determined to put in at least 2000 Pinotage vines now." Fieldmouse vineyards is on the ridge above the town of Vineland. It's on a crest and you can see Lake Ontario from his vineyards. Currently they are mostly planted with Concord and Fredonia hybrid vines that he inherited and which he is removing. This blog is a more up to date method of communicating than the infrequent news-letter.